Our San Antonio, Texas bail bonds office helps people across the city get the bail they need to get out of jail fast. 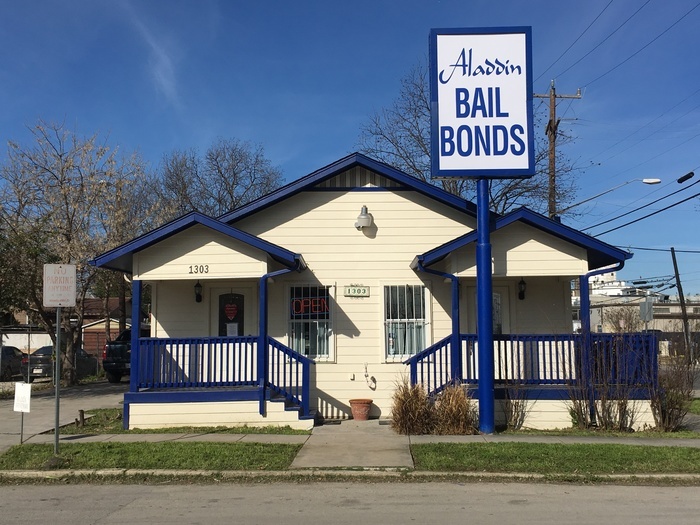 As the nation’s largest and most trusted bail bonds company, Aladdin provides the expertise and experience needed to help you or your loved one get through the bail bonds process as quickly as possible in San Antonio and surrounding communities. Our office is on W. Houston St., just a few blocks from Bexar County Adult Detention Center and less than one mile from the San Antonio Municipal Court. You’ll find us at 1303 W. Houston St., San Antonio, TX 78207, on the corner of W. Houston St. and N. San Marcos St. We’re also conveniently located less than one mile from the San Antonio Police Department, which is located at 515 S. Frio Street Suite B, San Antonio, TX 78207. We’re also located right by Cattleman Square and Downtown. In addition, our San Antonio bail bond office is centrally located and offer complete and trusted bail bond services to customers to neighboring suburbs and cities such as: Alamo Heights, Balcones Heights, Castle Hills, Garden Ridge and Hollywood Park. Visit us 24 hours a day, 7 days a week for expert, bilingual advice on the bail bonds process. You can also call our office at (210) 224-4222 for help immediately over the phone. We can get the bail bonds process started right away for you in person or on a call, so you or your loved one can get released from jail as quickly as possible. Plus, we make it easy with payment options that suit your financial needs. You can make a free payment online, 24 hours a day. If you or a loved one in San Antonio or Bexar County needs to get out of jail fast, your best choice is Aladdin Bail Bonds. You can count on us to be a trusted partner to provide you excellent customer service from start to finish. Our clients are treated like family, not a number. Every situation can be handled by our professional bail bondsmen. Our bail process is quick, easy and without judgement. At Aladdin Bail Bonds, we get you out. We get you through it. Not sure what is required of you? We understand your situation and guarantee professional, helpful service without judgment. Aladdin’s San Antonio bail bond office is staffed with local bail bondsmen to provide excellent customer service. For immediate assistance, you can reach our agents in three convenient ways. You pay a small portion of the full bail amount to start the release process. We’ll work with you to create a payment option that fits your financial situation. We present the court with the full bond amount owed and quickly secure the release of you or your loved one.